Damages caused by windstorms can have seemingly insurmountable effects on your property and yard. 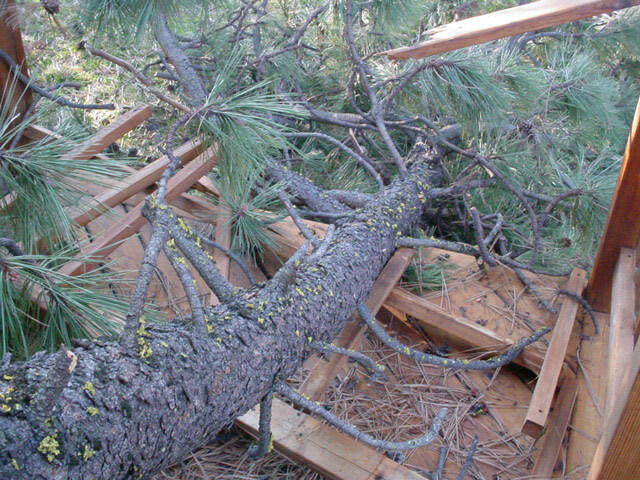 Uprooted trees, busted windows, and roof damages are some of the most common disasters associated with extreme winds. Strong thunderstorm winds that cause damages such as these at the ground level are a result of outflow generated by a thunderstorm downdraft exceeding 50-60 mph. As the rainy season approaches, know that ServiceMaster Recovery Specialists in Bend, OR are here to help clean up the aftermath of severe storms. We remove trees that have been uprooted or fallen over from the premises including all branches, trunks, and organic debris. We also provide board up services in case windows have been busted through or structural damage has occurred. Probably the most common wind damage we see affects the roof of the building. Whether it’s a tree or other flying object that has physically struck the roof or just the result of breakage due to high pressures, we’re capable of repairing any damages in an efficient and professional manner. We have multiple roofing contractors we work with on a regular basis to ensure rapid response, skillful work, and expert service. Call ServiceMaster Recovery Specialists for your property in Bend, Oregon that has suffered wind damage and we guarantee that skilled and experienced technicians will be on site for you when you need it most.